Should You Use Your 401(k) Money To Pay Off Debt? HomeBlog Debt ReliefShould You Use Your 401(k) Money To Pay Off Debt? I read an article recently where a woman was asking if she should take money out of her 401(k) to pay off $15,000 in credit card debt (at 9.9%) so she could use the money to pay off her mortgage next year. In this woman’s case, taking money out of a 401(k) to pay off her credit card debt was probably not a good idea because she will be 61 in December of this year. This means she would not have to pay a penalty on the withdrawal but would have to pay taxes on it. While 20% would be automatically withheld from the distribution, her tax bill could still be higher depending on her state and federal tax brackets. For example, if she were in the 25% federal and 8% stake tax brackets, she would owe $3,750 to the feds and $1,200 in state taxes on that $15,000 withdrawal. This means that even without having to pay any penalties, she would still lose one third of her withdrawal to taxes. Plus, any money she took out would not earn any future tax-deferred returns for her. Taking money out of her 401(k) probably wouldn’t make sense for this woman, but it can be a way for you to pay off debt if you can borrow the money instead of withdrawing it. Most 401(k) plans will allow you to borrow up to $50,000 or half of what you have in your account, depending on which is less. In most cases, you will have five years to pay back that money and to whom are you paying back the money? You’re paying it back to yourself, which is certainly a better deal than paying back the money you’d borrowed from a bank or credit union. What can you do about paying off debt if you don’t have a 401(k)? There are several ways you could do this. You could borrow from a bank or credit union and use the money to pay off your creditors. If you owe less than $10,000, you could probably get an unsecured loan or what’s often called a signature loan. If you all more than $10,000, you would probably have to get a secured loan or one where you have to use some asset as collateral. Unless you own a boat or second home, that asset will probably be your house and the loan will be either a second mortgage or a homeowner’s equity line of credit. The biggest pros of a debt consolidation loan are that your monthly payment should be lower than the total of the payments you’ve been making and your interest rate should be lower. 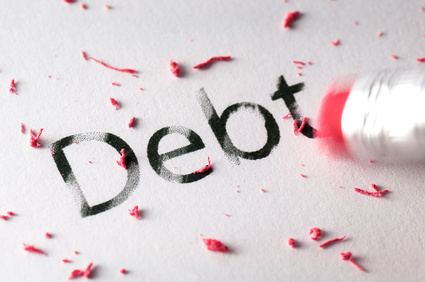 If the debt you would be paying off is credit card debt, you’re probably paying more than 18%. In comparison, a second mortgage or home owner’s equity line of credit should have an interest rate of 5% or less. Unfortunately, there is a downside and that’s the fact it will take you anywhere from five to seven or even 10 years to pay off the loan. A second alternative to taking money from a 401(k) is called consumer credit counseling. There may be a credit-counseling agency in your area. If not, you can always find one online. But do make sure the agency you choose is a non-profit and provides its services free or for very low cost. This, too, is form of debt consolidation because the agency will help you develop a payment plan and then negotiate with your creditors to accept it. Once they do, you won’t have to pay them any longer. The agency will take responsibility for making the payments and all you’ll have to do is send it a payment a month until you complete your plan – which typically takes five years. Our debt counselors can settle your debts and probably for thousands of dollars less than you owe. We charge no upfront fees and can likely help you become debt free in 24 to 48 months. Call our toll-free number today to learn what debt settlement could do for you.